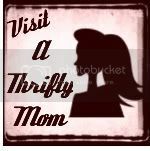 CRAFTY AND COUPONING BEAUTY SITES! Would you like to be featured on our links page? We could do a link exchange! Place our button on your blog and then email us and let us know, along with your button code of course. Then we will add you to our blog roll!